We've found today's very best Microsoft deals, so you can get the cheapest Microsoft Surface prices possible. If you're looking to bag a brilliant deal on the latest Microsoft Surface devices, updated with fresh new technology in October 2018, then you're in luck. We've found today's cheapest prices for the 2018 Microsoft Surface family of products. So whether you're looking for the new black Surface Pro 6, the Surface Studio 2 all-in-one touchscreen desktop, or any other model in Microsoft's fantastic Surface family, we've got you covered. So far, a lot of the best Microsoft Surface deals we've seen have arrived in the form of Surface Book deals. 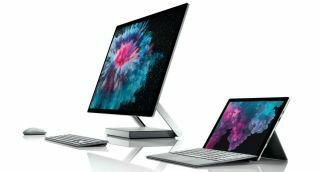 That's because the Surface Book – our laptop of the summer in 2017 – was replaced by the stunning Surface Book 2 and retailers are looking to shift their older stock. The Surface Book remains an incredibly powerful machine, though. We gave the Surface Book five out of five stars when we reviewed it. It's powerful, flexible and has a stunning screen – so if you don't mind buying an older model, there are still some incredible savings to be made. Read on to find the best Microsoft Surface deals right now, across the entire Surface family of devices. Thanks to its powerful 8th-generation quad-core Intel Core i5 or Core i7 processor, the latest iteration of the 12.3-inch hybrid tablet/laptop Surface Pro delivers much greater speed and performance that previous models. It has also returned to the all-black design that the Surface Pro first launched with. Boasting up to 16GB of RAM and 1TB of storage, the new Surface Pro 6 provides users with a smooth experience to help them stay productive. It can also switch between laptop, studio, and tablet modes easily to keep up with your demanding workflow. The Surface Pen (sold separately) offers pressure sensitivity of 4096 levels, while the multi-position Surface Pro Type Cover lets you use the Surface Pro like a laptop. Thanks to a powerful Intel Core processor, the Surface Pro delivers great speed and performance that previous models. With all this power under the hood, the original Surface Pro provides users with a smooth experience to help them stay productive. It can also switch between laptop, studio, and tablet modes easily to keep up with your demanding workflow. With a stunning 4,500 x 3,000 resolution 28-inch PixelSense touch-sensitive display, the Surface Studio 2 all-in-one PC is specially designed for creative work. And now with a quad-core Intel processor and an Nvidia Geforce GTX 1070, it’s great for design work and gaming alike. Unlike Apple’s iMac all-in-one, Surface 2 has hinges at the back that lets you fold it down so you're working on a (near) horizontal screen. It's a new way of working for desktop computing, whether you're drawing or writing. With up to 32GB of memory and 2TB of super-fast SSD storage, this is a computer that could last you years. With such a beautiful display, it could be well worth the investment now. With an impressive 28-inch PixelSense Display, the Surface Studio is specially designed for the creative process. Capable of switching and adjusting to follow how you work, the Surface Studio is powered by Intel Core processors and an NVIDIA GeForce dGPU to help bring your work to life. As with the Surface Pro, the Surface Laptop 2 is available in matte black, as well as four other colours. Its innards have also had an upgrade, with an 8th-generation Intel processor, and a battery that will last up to 14.5 hours. Boasting a vibrant 13.5-inch PixelSense Display with immersive touchscreen, the Surface Laptop features up to 16GB of memory and up to 1TB of storage, giving enough performance to power through taxing graphic design software as well as light use such as social media, surfing the web and document editing. The beautifully designed and crafted Surface laptop matches its elegance with its performance. Boasting a vibrant 13.5-inch PixelSense Display with immersive touchscreen, the Surface Laptop gives users more room to get creative. Available in four colours to suit your style (burgundy, platinum, cobalt blue and graphite gold), this laptop packs the best of Windows and Office. At 15 inches, the beautiful 2-in-1 Microsoft Surface Book 2 introduces a larger form factor to the original Surface Book. In our view, this is the world’s best 2-in-1 laptop: it’s incredibly powerful, with a dazzling 15-inch PixelSense display (or you can choose the compact 13.5-inch Surface Book 2), and boasts a battery life of up to 17 hours. It’s also incredibly flexible – with laptop, tablet, studio and view modes – and lightweight to boot. Prices are unlikely to come down much, but if there are any deals to be had anywhere, you’ll find them right here. The first iteration of the Surface Book remains an impressive model – and with huge price cuts likely while stocks last, Microsoft's first-ever 2-in-1 laptop makes an irresistible prospect for creatives. With an innovative Performance Base that delivers crisp, vibrant graphics and up to 16 hours of battery life, if you can get your hands on the Surface Book you won't regret it. Microsoft’s answer to the iPad, the Surface Go is a more affordable, portable device for lighter use. It sports a 10-inch PixelSense touch-sensitive display with 1800x1200 resolution. The Surface Go delivers great performance for Netflix, social media and document editing. It runs Microsoft’s Windows 10 S, a lighter version of Windows that runs apps from the Microsoft Store for enhanced security, as all content has been vetted before publication.